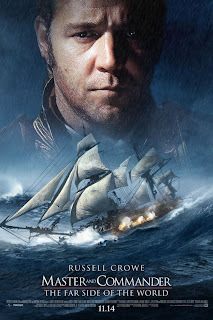 Logline: Life aboard a ship during the Napoleonic Wars, focusing on two main characters--the ship's surgeon and the ship's captain. Running Time: 2 hrs. 19 min. MPAA Rating: PG-13 for for intense battle sequences, related images, and brief language. During the Napoleonic Wars, Lucky Jack Aubrey captains the crew of his H.M.S. Surprise. When the ship is suddenly attacked by a superior enemy, it is badly damaged and much of his crew is injured. In a bold and dangerous move, Aubrey decides to set sail in a high stakes chase across two oceans to intercept and capture their foe. It's a mission that can decide the fate of a nation--or destroy Lucky Jack and his crew.